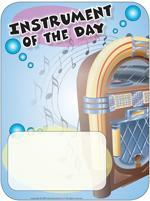 Songs, rhymes, musical instruments, dancing, and rhythm activities are all tucked into this musical theme! During circle time, sit in a circle with your group. Ask each child to stand up, one at a time. Invite them to choose a song and hum it. The other children try to guess which song it is. Once they have found the song, the child who was humming can sit down and the other children stand up and clap loudly. (Open poster - Instrument of the day) Print and laminate. Select one instrument per day and present it to your group during circle time. Display a picture of the instrument on the poster so children can refer to it throughout the day. Thematic bin: microphones, costumes, mirrors, empty makeup containers, musical instruments, glasses, scarves, tape recorder with blank cassettes, songbooks, books with sheet music, CDs, etc. (Open model - musical notes) Print and glue the notes on cardboard. Cut them out and hang them from the ceiling. The pictures may be used as a memory game or to spark a conversation with the group. Use them to decorate the daycare or a specific thematic corner (Open picture game - Music) Print, laminate, and store in a "Ziploc", bag or in your thematic bins. Homemade blocks made with cardboard boxes, metal cans...add tiny bells or other materials inside. Various materials which may be used to create musical instruments. Sheet music children can draw on. 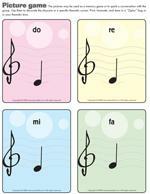 Music class: various musical instruments, sheet music with notes, a conductor's baton, songbooks, chairs, desks, etc. Puppet theater: puppets children can use to practice different voices...singing, high-pitch, low, etc. Memory game with educatall.com pictures. Real musical instruments which can be manipulated and explored. Association games involving musical instruments (wind, string, and percussion instruments). Books about musical instruments and musical staffs. Earphones and CDs of various styles of instrumental music. Posters of different types of instruments to decorate the walls. Obstacle course involving musical instruments children must play at various stages of the course. A small bin filled with different sizes of bells which produce different tones. A bin filled with small containers (film or pill containers) filled with various materials which produce sounds...try to associate them! Fill various sizes of plastic bottles with a variety of objects which produce sounds. Decorate them with fun colors. Babies will spend hours manipulating them (Yop yogurt containers are the perfect size for little hands)☺. Maracas, tambourines, and xylophones are all fun musical instruments for babies. Arrange a small bin you can present them with now and then throughout the theme. Babies often love music. Use this theme to introduce them to various musical styles, music from different countries...etc. Dance together. Rhymes are packed with rhythm and allow babies to assimilate them. Sing rhymes when you change diapers, at lunch time, during transition periods, etc. You can illustrate rhymes to provide visual support. 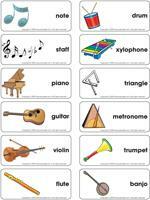 Use educatall.com pictures to show babies different instruments throughout the theme. Concentrate on the most common instruments like the piano and the guitar. (Open picture clue story - Music) Print. Sit in a circle with your group. Begin reading the story. Pause for each picture clue. Point to the clue and have children guess the missing word. Children dance to the sound of rhythmic music. When the music stops, children must stand still, like statues. If a child moves, he must sit down on the floor and wait for the next round. Give each child a scarf. Alternate between rhythmic music and soft music... Children move their scarf to the sound of the music. They can throw their scarf up in the air, spin it around, etc. Stand in a circle, holding each other's scarves. Children trade scarves and repeat. You will need 6 to 8 glass jars. Leave one jar empty and fill the other ones with different quantities of water. The last jar should be completely full. Pour a small amount of food coloring in the water to make the levels more visible. Let children discover the various sounds they can produce by tapping the jars with a wooden spoon or a metal spoon. Line the jars up according to the level of water in each, from the highest pitch to the lowest pitch. Variation: You may add objects such as metal cans, a cardboard box, plastic containers, etc. Children will perceive different sounds. Each child selects an object which produces a sound. All the children hide, except one. This child must find his friends. The children who are hiding make sounds with their object to help him. This activity is perfect for outdoors. Begin singing a song and then stop and point to a child. This child must continue the song (singing or humming). Musical foot. Trace and cut various foot shapes out of construction paper. (Open model - footprints) Laminate them and glue them on the floor. To the sound of music, children dance around, with their feet on the footprints at all times. Gather all the toys you have in your sandbox and organize your very own percussion orchestra! Prepare a small concert for another group. Use a drum to establish the rules of the game with your group: 1 tap, children walk; 2 long taps, children walk slowly; 3 quick taps, children run...etc. Enjoy moving about the yard or the daycare following the drum's rhythm. Ask children's parents if they play a particular musical instrument. If they do, invite them to come play their instrument during an afternoon snack. It can also be a grandparent, brother, or sister...etc. Ask parents to share the music they listen to at home with you. Let children enjoy the music. Invite parents to come teach the group a few dance steps like the cha-cha, samba, waltz, etc. There are surely some good dancers among parents and grandparents. (Open magnifying glass game - Music) Print and laminate the board game and the illustrations. Cut them out and store them in a box or in a plastic bag. Children pick an illustration and search for it on the board game, using a magnifying glass. Once they have found a match, they deposit the illustration in the correct square, on the board game. (Open association game - Music) Print and laminate the game. Children must associate the illustrations representing instruments to the correct category and stick them to a square at the bottom of the correct card. (Open dominoes - Music) Print, glue to cardboard, and laminate. This game is for 2 to 4 players. Each child picks five cards. Place the remaining cards in a stack on the table. Turn over one card. The first player tries to deposit one of his cards which matches an illustration already on the table. Matching illustrations must be touching. The second player does the same, and so on. If a player does not have a card with a matching illustration, he must pick an additional card from the stack. If he is still unable to play, his turn is over. The game ends when a player has used all his cards. (Open hunt and seek - Music) Print and laminate. Children pick an illustration and search for it in the larger picture. (Open educ-pattern - Music) Print and laminate. Children must complete each pattern by placing the correct illustrat ions in the squares using Velcro or adhesive putty. (Open educ-same and different - Music) Print and laminate to ensure the game can be enjoyed over and over again. Children must circle the illustration which is different in each row. Practice singing a few songs with your group and have your choir sing in a retirement home near your daycare. Deposit small illustrations which represent the songs you wish to sing in a special box. Decorate the box (yourself or with your group). Children take turns picking a card, associating it to a particular song and singing the song with their friends. Direct an imaginary orchestra! One child is the conductor. Using his baton, he encourages the other children to play music fast, quietly, loudly...depending on the movements you established prior to the activity. Each child is given a turn to be the conductor. Children can pretend to play instruments. Play different types of music during your relaxation period. 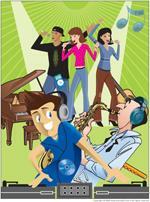 This will give children a chance to discover new music styles, new tones, etc. Prepare popcorn using a microwave oven or a popcorn machine. Listen to the popping sounds! Prepare an exotic recipe...and listen to music from the country while you cook and eat! Make music with soft drink bottles. Simply hold a bottle in front of your lips and gently blow above the opening. The sound will vary if you fill the bottles with different levels of water. Fill 8 glasses with different levels of water. Have children tap gently on the glasses using a wooden spoon and listen to the sounds. Present children with different musical instruments. Blindfold children one at a time and play an instrument. The blindfolded child must guess which instrument you are playing. Show children how to place their lips to whistle...practice throughout the theme. Find a real drum (or a toy version) and use different types of drumsticks to tap on it...real drumsticks, metal spoons, wooden spoons, chopsticks, pipe cleaners, etc. Cover a toilet paper roll with aluminum paper. Apply glue to a ball of Styrofoam and roll it in a platter of silver sparkles. Insert the ball in the end of the toilet paper roll. Use an old shoebox to make a guitar. Punch a hole, about 8 cm in diameter, in the cover of the box. Put the cover back on. You will need six different sizes of elastic bands. Slide them next to each other, over the hole so you don't smother the sound. Children will hear guitar sounds when they pinch the elastic bands. Use a piece of cardboard and adhesive tape to close off one end of a paper towel roll. Pour rice into the maracas until half full. Have children hold it while you close off the other end. Children decorate their maracas as they wish. 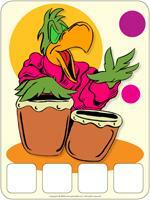 Shake the maracas to create various rhythms and have children reproduce the rhythms. Divide your group into two teams. Have each team sit at a table. Give each team one large sheet of paper and one pencil. Play music. One child from each team begins a drawing. When the music stops, another team member continues the drawing. The activity continues until each child has had a turn. Play different types of music. Use an empty paper towel roll and ask children to decorate it with various materials. When they are done, they may use it to pretend they are orchestra conductors. Use coffee cans, ice cream tubs, or metal containers with plastic lids to create drums. Children may decorate their drums as they wish using paper, glue, paint, markers, etc. Use two strong paper plates. Fill the first plate with small pebbles found outside (or aquarium pebbles). Place the second plate on top and staple the contour. Let children decorate their tambourine. (Open creative coloring - Music) Print for each child. Invite children to draw musical notes. 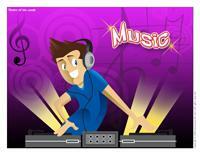 (Open coloring pages theme - Music) Print for each child.